2. Split and peel away the casings of the sausages; discard casings. 3. Press the link into a flat, thin patty no more than ½-inch thick. 4. Put no more than 4 patties into a small (quart/litre) cooking pouch and vacuum seal. 7. Before serving, if desired, sear the surface of the patty under the broiler for a minute or two, or on a lightly oiled skillet or grill over high heat for 30 seconds, or even with a kitchen torch to create a nicely browned crust. 8. 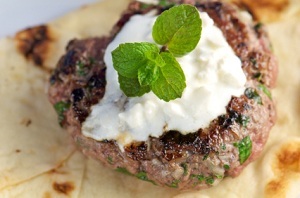 Serve topped with a tablespoon or two of tzatziki sauce and a mound of condiment salad. 1. Put the onion in a small bowl and cover with water and a splash of the lemon juice. Let it soak for a few minutes to take away the ‘bite’. 2. Put the onions and all ingredients in a bowl and toss with the olive oil and vinegar.